Creativity is the ability to come up with original, surprising and useful ideas. Intelligence, on the other hand, can be defined as a domain-general ability to solve complex adaptive problems. Intuitively, both intelligence and creativity seem to be related to, and dependent on, each other. However, it has become more and more apparent, that intelligence and creativity, though linked, are separate constructs having separate antecedents and separate consequences. I have blogged previously about how creativity and intelligence may be opposite ends of a continuum and specifically related to the two facets of Openness-to-experience personality dimension. To recap, while creativity is more towards the Openness end of Openness-to-experience, intelligence is more inclined towards the Intellect end of the scale. I have also blogged how creativity and intelligence fit with the Blind Variation and Selective Retention (BVSR) theory, as proposed by Campbell, with creativity leaning towards the blind variation part of the process and intelligence leaning towards the selective retention. It is with exceptional pleasure that I note that others have come to the same conclusion. Rex Jung in Frontiers in Psychology writes about the same relation between creativity and intelligence and also extends it to compare that with the spectrum conditions of Psychosis and Autism. Now I have been a long time early champion of the view that Autism and Psychosis should be conceptualized as opposite ends of a continuum, and had also extended the idea that roots of this may be the difference between intelligence and creativity. And it’s always welcome to get more support and confirmation for the idea. But before we go further, let’s take a moment to recall that autism is a neuro-developmental disorder characterized by social and communication difficulties and repetitive and restrictive interests and behaviors. Psychosis, on the other hand is the florid everyday ‘madness’, characterized by delusions, hallucinations and disorganized behavior and speech. Psychologists from Nettle to Crespi & Badcock have theorized that these lie at opposite ends of a mentalizing- systemizing continuum and considerable empirical evidence in support of that thesis has accumulated over the years. This paper by Rex Jung, looks at multiple evidence to elucidate the relationship between intelligence and creativity and how the relationship parallels that between say autism/ psychosis or cognitive control network and default mode network or say between cause/effect reasoning and abstraction/ metaphor reasoning. Although there are many naysayers to the relationship between creativity and madness (psychosis), the myth of the creative, but afflicted, genius endures and that too because there is some substance to the argument. Research by Kay Jamison, Nancy Andreasen and others has shown some evidence in this regards. For example, bipolar disorder is much more prevalent in creative writers and poets; and similarly relatives of people suffering from schizophrenia, who may themselves be Schizotypal, have been shown to be more creative than the general population. In a similar vein, though being a neuro-developmental disorder, many people with autism have low IQ, those with high IQ are not that uncommon and then there are many autistic savants who have exceptional abilities in say mathematics, calendar computation, memory or other such areas. Also apparent is the markedly different processes underlying creativity and intelligence; similar different processes are likley to underlie psychopathological diseases like autism and schizophrenia. There is a good image accompanying the Rex Jung article in Frontiers in Psychology summarizing the differences between creative and intelligent processes and associations. At the root, Rex surmises that "while intelligence supplies a “dedicated reasoning capacity” for problems that possess rule-based, cause-effect relationships; creativity emerged as an adaptive cognitive mechanism for low frequency, “improvisational reasoning,” where solutions to problems are unsighted and probabilistic approximation could lead to novel solutions." 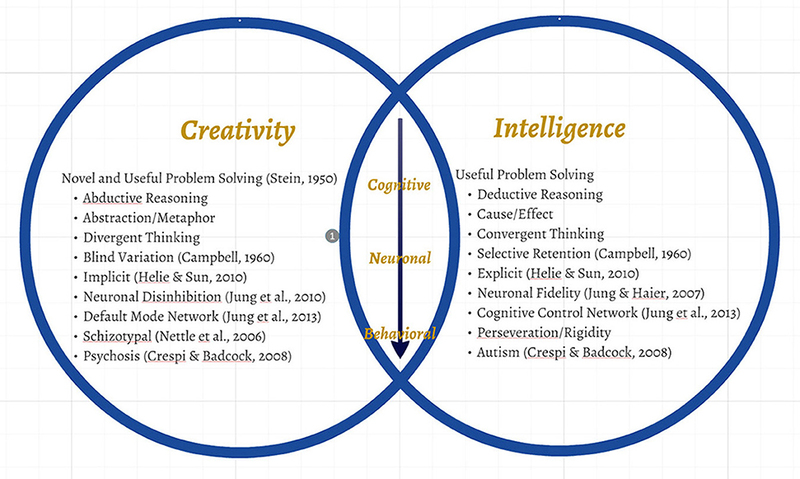 Also important to note is that while creativity may have evolved recently, intelligence has been around for a time. Given the recent evolution and relative infrequency of use of creativity, it’s no wonder that natural selection has not been able to fine-tune creativity that well and we still pay a heavy price by having some individuals occasionally go ‘mad’ so that the rest of us can solve infrequent adaptive problems creatively. I am disturbed by your definition of Asperger's Syndrome. "...those with high IQ (or Asperser’s syndrome)..."
This is not correct as I understand it. People diagnosed with Asperger's can be of high or low intelligence. I have always understood Asperger's syndrome as meaning high-function Auitism; not high intelligence Autism. There is a big difference. Our daughter was diagnosed as Asperger's by a developmental pediatrician at age 3. She also had an IQ test at age 10 which gave a score of 85. While I think there were problems with that test (I was not there to settle her down or ensure her co-operation), she has never shown signs of high intelligence, but I have no doubt about the Asperger's diagnosis. Hi Stephen, I agree. Asperger's is indeed high-functioning autism and may or may not be due to high IQ (though in all probability the high functioning is due to high IQ). Anyway the definition of Asperger's is tangential to the discussion so I have removed the reference to that. Persons on any part of the continuum of the Autism Spectrum can have a high IQ. High functioning Autism just means that a person on this end of the spectrum is observed as displaying lesser behavioural features attributed to Autism. A person with 'lower functioning Autism' displays more expressions of typical Autism, but this does not mean a lower IQ. One should not judge the intelligence quotient or even emotional intelligence quotient by what they see as expressions of abilities of an autistic person. Many autistic persons, once considered as 'lower functioning' have actually been discovered, by others who have pre-judged them, to have high IQ's once their voice and abilities have been truthfully recognized and understood. One cannot to presume the abilities of another if they have not chosen to get to know that person. Assumptions are unhealthy if they are used to value another person and claim to know the person's personal truth. You wanna polarize intelligence and creativity. Before you do that, you should take a few high-IQ tests. I think you will relax on that assumption afterwards. Places where you can find free ones. Nope. They may even be independent. Stupid new creations and thoughts, may seem to be the opposite of intelligence.. Then you have smart new creations and thoughts. Where would you put them, along 1 axis... ? Cmon..
"Creativitiy" as measured by many artists, is a lot about copy, disguise and then paste and pretend you figured it all out only by yourself (Madonna comes easily to mind). Believing in free will may be linked to happiness. They feed on each other. Can You Be Autistic and Bipolar at the Same Time?